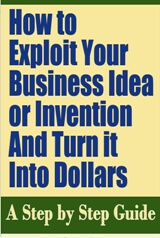 This guide will walk you step by step through all the essential phases of making money with a new idea or invention. 1. You've Got an Idea? Great! 2. You've Got an Idea? So What? 3. Can You Exploit Your Idea? 4. Is Your Idea Original? 5. How Will the Invention Be Produced and Distributed? 6. Will Your Idea Make Money? 7. Can You Protect You Idea? 9. Where Can You Go for Help? Can You Exploit Your Idea? How Will the Invention Be Produced and Distributed?